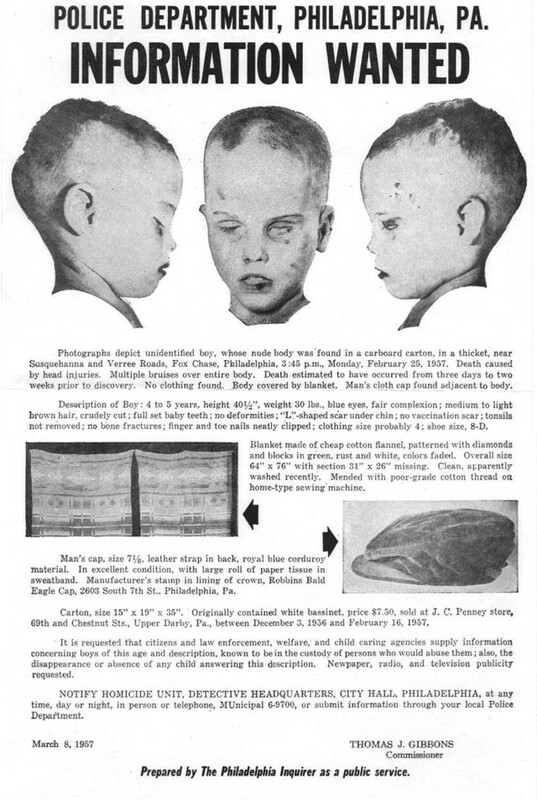 On February 25, 1957 in Fox Chase Philadelphia, an unidentified Caucasian male, probably between the ages of four to six years old, was found in a box. He was found lying face up and completely naked, only wrapped in a flannel-patterned blanket. 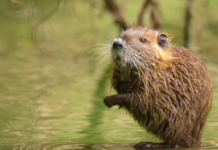 His arms were wrapped across his stomach and his body was clean. His finger and toe nails were also trimmed and cleaned properly. He had blue eyes, pale skin and medium to light brown hair–almost blonde. His hair seemed to have been cut in a very coarse and rushed manner. Bruises and scars were present all across his body. They looked like scars from surgical procedures. 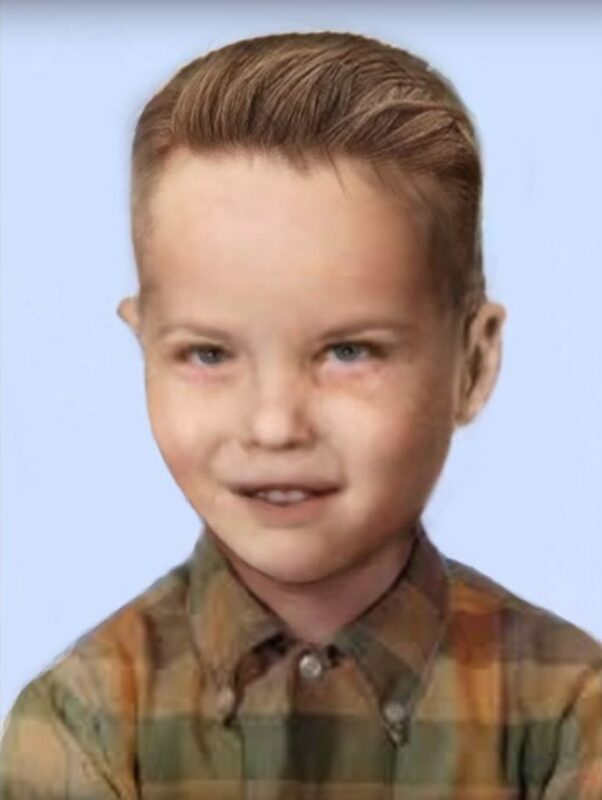 Police-colorized image from 2016, which was created with the hope that it would jog someone’s memory of the missing boy. 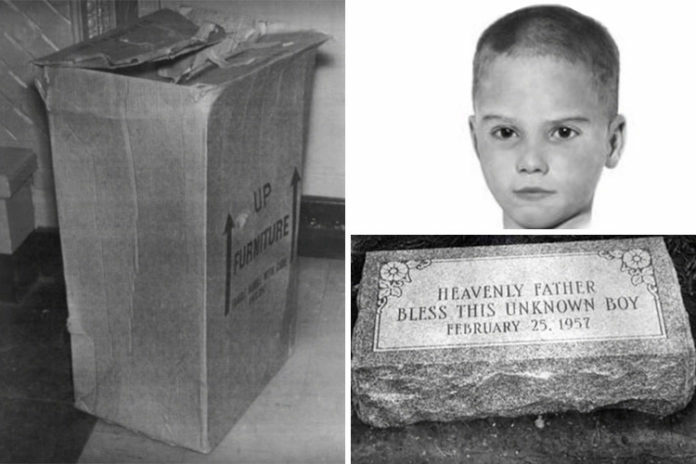 The little boy was found in a large cardboard box with the stamp “fragile” written on it. The original contents of the box was were bassinets from J.C.Penney Co. which sold for $7.50. At the time, the department store had a “cash only” policy, which ended up being unhelpful when trying to trace back to finding the murderer. When police first found the boy, they thought the boy’s identity would be revealed quickly. Thousands of posters of the boy’s image and description were plastered throughout Philadelphia and across the country. Although there were some promising leads, they all eventually led to dead ends. This strange mystery is still ongoing today and only gets more difficult as time passes. Check the America’s Unknown Child’s website, which is dedicated to solving this mystery. Buzzfeed also produced this video on the event.